I am 62 and as a child I had fairly acute Asthma which then became fairly manageable in later years. In the past five years it has been pretty poor indeed and typically I have been using Ventolin (reliever inhaler) 5 to 6 times a day, mostly at night and in the early morning. I have been jumping around between various prescribed Steroid / Corticosteroids Inhalers like Simbicort, Fostair, Flutiform etc (preventer inhalers) trying to get the Asthma under control but to no significant effect. In recent winters I have had recurrent heavy chest infections often resulting in at least a two week requirement of antibiotics; often only to then get a recurrence a week or so later. I am petrified of an infection turning to pneumonia, which is not always a killer but it’s got a strong track record! Read BUPA information on this. Two years ago I had looked into Halotherapy (Salt Cave treatments) but not really formed a definite view upon whether to try it or not and the nearest, salt cave to myself was at Milton Keynes, one hour away, and they made it clear one needed quite a few sessions to have any meaningful impact. At that time I did nothing regretfully. Finally I asked my GP to refer me privately to a top Professor in London. He gave me some sample jars to deposit phlegm/mucus in the day before my next appointment in 4 weeks time. For some bizarre reason I tried a sample that night and when rinsing out the jar the next morning under the tap I realised what Mucus is actually like… it’s not spittle it more akin to glue! I could hardly clean the glass jar and was quite horrified by the thought of this stuff stuck down in my lungs. I decided to book the M K Salt Cave that afternoon and visited in trepidation. I could not believe how simple it all was; turn up; fill out the usual medication and health form and disclaimer; recline on the comfortable chairs; breath and relax; keep your clothes on! Nobody speaks or plays with electronic gadgets. Some people read but often they soon drift into snooze mode. On exiting the more regular visitors seemed to offer encouragement to the new comers, that benefits would happen but only from several sessions. Frankly I did not notice much difference after the first two sessions but gradually I noticed I was clearing mucus from my throat quite significantly at about 11 a.m. most mornings; then there were mornings, even whole days of NO Ventolin. I did 3 sessions a week for two-three weeks.The 3 hour round trip was a nightmare but I felt I had really found something that might literally extend my life. When I returned to my London Specialist I recounted my Halotherapy experiences and he said he had other patients reporting similarly good results. I did ask him if maybe the lifting of Mucus was a self-fulfilling issue that effectively could never be defeated (i.e. you shift it, it just makes even more?). He assured me that was certainly not the case. Obviously the body will always make ‘some’ mucus since it is there to protect the linings of the lungs from Pathogens (foreign bodies, allergens etc) however he was adamant that any treatment that lifts old and excess mucus was absolutely critical to healthy lungs…. In a nutshell, keep getting it up! He explained the bugs and bacteria love nothing more than living in warm sticky mucus. He advised plenty of hand washing and avoid tube trains. I was discharged from his care on the second visit as he now seemed redundant to requirements. About 3 months later I felt the asthma slightly decline and I could tell a chest infection was starting. I noticed that the Saltcave.co.uk franchise had opened one in Brierley Hill, West Midlands. I did five visits over there which put me straight back on good form –no antibiotics required. The journey was equally too far away. The delightful lady that runs that Salt Cave has been hospitalised 6 times in two years, she then did a series of sessions at Milton Keynes, a 5 hour round trip for her, and is now off all medication. Hence she opened her own franchise. That then set me thinking that if I may need regular ‘top ups’ maybe I open my own Salt Cave too. My son and myself did endless research trying not only to establish the best equipment, techniques etc but to completely satisfy ourselves that salt inhalation even at minute doses is safe. The Salt Therapy Association of USA and The Salt Chamber inc. were extremely helpful. We discovered that ideally the salt chamber should be lined with natural Himalayan Salt blocks. The standard visit duration in USA seems to be 45 minutes. In conclusion, at considerable cost, we have now created Little Himalaya Salt Rooms in Kenilworth, primarily to save my own life, but hopefully it will help others too. This line of therapy can only fall into what is known as ‘alternative medicine’ and as such is unregulated, just like acupuncturists, chiropractors, osteopaths etc; hence it is important that people take responsibility to satisfy themselves that it is safe and appropriate for themselves. We cannot claim “it is a cure”. It is not advised for patients with cancer or stage 2 or 3 heart failure. When alerting my G.P. to this facility in our town, I was again surprised and pleased that he felt too often we were in the UK too quick to condemn drug free solutions and to disregard scientific knowledge from Russia and the East. We think Little Himalaya is now offering the best facility in the UK but I would say that wouldn’t I! 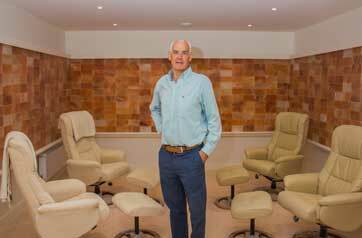 It is not part of the Salt Cave.co.uk franchise but frankly if you are minded to go to a salt cave then I would recommended that you use the one most local to you, all the treatment centres are superb, it is the travel that becomes annoying.